What is the Bridge Device? 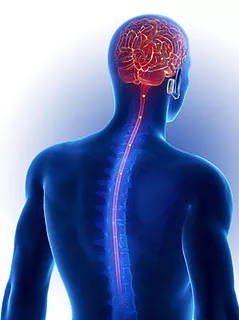 The Bridge Device is a small, FDA cleared electronic device about the size of a half-dollar, which is worn behind the ear, delivers tiny electrical signals into the brain that block the transmission of pain signals sent from the spine and brain. It is usually worn during the initial 3-5 days of the detox process when withdrawal pain and symptoms are most severe. A little larger than a half dollar, the Bridge Device fits behind the ear and sends electrical feedback to the brain, blocking the pain signals that are associated with withdrawal of opiates during detox. Once past these stages of withdrawal and detox, it is now highly recommended to undertake a long-term program to stay sober, such as counseling and medication-assisted treatment such as Naltrexone. How does the Bridge Device work? The Bridge works by hitting the body where addiction starts: the brain. 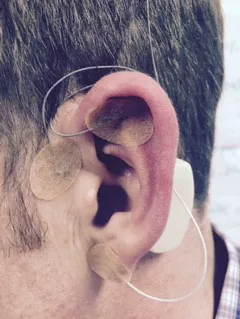 The device fits behind the ear and sends electrical feedback to the brain, blocking the pain signals. The Bridge takes advantage of 4 cranial nerves that are well represented in the auricle. Cranial nerves 5, 7, 9, and 10. These nerve go back to the brainstem and into the spinal cord and disrupts efferent and afferent pain signals. The Trigeminal nerve (5) has its nucleus in periaqueductal grey area of the spinal cord. 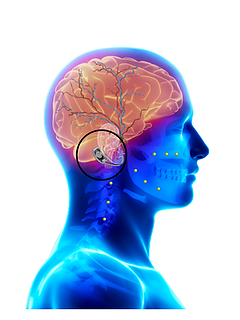 This area controls the descending pain tracts and are rich in endorphin producing cells. The Vagus nerve (10) controls autonomic nervous system and stimulating the vagus nerve increasing the para-sympathetic nervous system. In concert, the pain associated to opiate withdrawal is dramatically reduced upon placement of the Bridge. Studies show that 85% of the symptoms are reduced within 30 minutes, and most of it occurs within the first 15 minutes. Our recent imaging study shows a 50% reduction of firing activity in the amygdala, the area of the brain responsible for fear and anxiety. The device isn’t recommended for those with pacemakers or those who are pregnant or have a history of seizures.